I imagine that most readers of MusicWeb International quickly scan the day's main headings and then, if a work or artist interests them, jump straight to reading the review. The details of recording dates and venues are, more often than not, I’d guess, passed over without a great deal of attention. To do so in this case would be to miss something of great significance, for these recordings were made in Berlin on 8 and 9 July 1940, replicating live performances given just a few days earlier. In other words, less than seven weeks after the Netherlands had suffered a bloody, unprovoked invasion, lost a campaign, surrendered to an invading German army and been occupied by enemy forces. That country’s pre-eminent native conductor could be found leading the flagship German orchestra in the capital of Nazi Europe. Just as it does in Furtwangler's case, the controversy over the Germanophile Mengelberg's collaboration with the Nazis remains unresolved. Claims that he was essentially apolitical, that he protected Jewish members of his Concertgebouw Orchestra or that he attempted to continue promoting the banned “Jewish” music of Mahler are all asserted. They are even more convincingly contested for it is an incontrovertible fact that, unlike many other conductors in Nazi-occupied countries, Mengelberg adopted a high-profile highly supportive attitude to the new status quo. After the war’s end he was judicially condemned as a collaborator and his career came to an ignominious end. As those preliminary observations indicate, these recordings certainly have some historical/political/cultural significance. Any inherent musical importance is, however, rather less apparent. The concerto can be considered - and dismissed - quite quickly. Hansen was a competent enough pianist. He was a student of Edwin Fischer, though it is worth pointing out that in the 1930s, when one might have been expecting him to be pursuing a solo career, he was just as often to be found acting as his mentor’s teaching assistant. In all honesty, Hansen was probably out of his depth when partnered with Mengelberg and this recording has never been particularly highly rated, not simply because of the soloist’s adequate though generally undistinguished performance but also because of a horrendously cut first movement cadenza - blamed by charitable critics on time constraints. Perhaps a more appropriate soloist for this politically-charged recording might have been Hitler’s favourite, the notoriously pro-Nazi Elly Ney, who certainly had Tchaikovsky’s first concerto in her repertoire. Indeed, she had played it at the London Proms with Sir Henry Wood just a decade earlier, though one imagines that, as a notorious racist and anti-semite, she probably left the Albert Hall post-haste before the programme’s subsequent items that included Mahler’s first symphony and Marian Anderson singing a couple of spirituals. What of the recording of the Tchaikovsky fifth symphony? Again, this is not a performance for the ages. It is, though, characteristic Mengelberg: wilful, idiosyncratic, one-of-a-kind. Not only does the conductor impose his own tempi, dynamics and phrasings throughout the score, but he also makes a couple of quite drastic cuts in the finale. Interestingly enough, even though his audiences expected - and, at that time, generally saw no great harm in - that sort of practice, in the case of this particular symphony Mengelberg felt compelled to justify his interventionist approach. He claimed that Tchaikovsky’s brother Modest had told him that the composer himself would have approved the modifications - a suggestion that gave rise to the memorable observation, on a later occasion when Mengelberg tinkered with Bach, that he had presumably consulted “Modest Bach” on the matter. This, then, is a performance that tells us much more about interpretative practice in the first half of the twentieth century than about Tchaikovsky’s score. As such, it is certainly worth hearing, but you may not want to listen to it on a regular basis and it certainly won’t displace any of the many other fine recorded accounts of this work. Pristine Audio and Mark Obert-Thorn have done a sterling job in bringing a greater degree of clarity to these 72 years old performances than we have ever heard before. 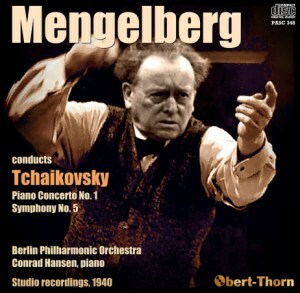 It would be a good thing if this release were to tempt those listeners who know him only by reputation to sample Mengelberg’s undoubted artistry, tainted in reputation though it unfortunately remains thanks to the conductor’s questionable wartime stance.